The act of judging is complex involving finding facts, interpreting law, and then deciding a particular dispute. But these are not discreet functions: they bleed into one another and are thus interdependent. This article aims to reveal-at least in part-how judges approach this process. To do so, I look at three sets of civil RICO cases that align and diverge from civil antitrust precedents. I then posit that the judges in these cases base their decisions on assumptions about RICO's purpose. These assumptions, though often tacit and therefore not subject to direct observation, are nonetheless sometimes revealed when a judge narrates legislative history. 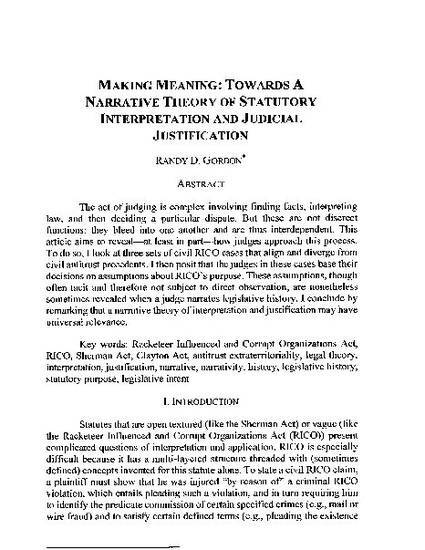 I conclude by remarking that a narrative theory of interpretation and justification may have universal relevance.